Rh immune globulin is a blood product used as a medication to prevent Rh iso-immunisation. Anti-D gammaglobulin, anti-D (Rh o) immunoglobulin, anti-Rh immunoglobulin, anti-Rh o(D), D (Rh o) immune globulin, RhD immune globulin, Rh immune globulin, Rh-IG, and Rh o(D) immune human globulin. What does it mean to be Rh negative? There are four different blood types (A, B, AB, and O). There is also an antigen called the Rh factor. The Rh factor (ie, Rhesus factor) is a red blood cell surface antigen that was named after the monkeys in which it was first discovered. If the Rh factor is present on the red blood cells, the person is Rh positive (Rh+). If the Rh factor is not present on the RBCs, the person is Rh negative (Rh-). Approximately 85% of the world’s population is Rh+. Being Rh- is a genetic trait passed from parents to their offsprings. It is not a disease and has no effect on the life and general health of an individual. However Rh- blood group can cause problems in pregnancy if the fetus is of Rh + blood group. Although the Rh blood group systems consist of many antigen subtypes (eg, D, C, c, E, e), the D antigen is the most immunogenic; therefore, it most commonly is involved in Rh incompatibility. What is Rh alloimmunisation/ Rh incompatibility / Rh disease ? If a fetus is Rh (D)-positive and the mother is Rh (D)-negative, the mother is at risk of Rh(D) alloimmunization. When the fetal blood cells enter the maternal circulation, the mother’s body mounts an immune response i.e., develops antibodies against Rh factor present on fetal red blood cells. This usually does not effect the first pregnancy because the maternal and fetal blood do not usually mix. The fetus receives nutrients and oxygen from the mother through the placenta by diffusion. The placenta acts as an exchange surface between the mother and the fetus but it does not allow the blood from the mother and fetus to mix. However, in a few situations, Rh-positive fetal red blood cells mix with Rh-negative pregnant mother’s blood secondary to fetomaternal hemorrhage during the course of pregnancy. This can occur due to spontaneous or induced abortion, trauma, amniocentesis, ectopic pregnancy, invasive obstetric procedures including C-section and even normal delivery. It can also occur when an Rh-negative female receives an Rh-positive blood transfusion. 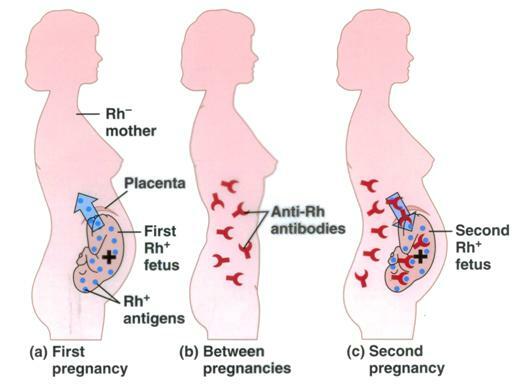 In the second pregnancy, antibodies against Rh (D) antigens are present in maternal blood. These maternal Rh immunoglobulin G (Ig G) antibodies persist for life and may cross freely from the placenta to the fetal circulation. These antibodies attack the fetal Rh + blood cells leading to a spectrum of conditions ranging from hemolytic anemia of newborn to hydrops fetalis to erythroblastosis fetalis. In countries without Rh IG protocols, as many as 14% of affected fetuses are stillborn and 50% of live births result in neonatal death or brain injury. Because of the possibility of serious complications, it is recommended that all Rh – mothers, receive Rh-Ig at about 28 weeks gestation, and again shortly after delivery. It is also given within 3 days of a potential exposure to Rh-positive blood from the baby such as may occur during miscarriage, trauma, delivery, etc. In an Rh – mother, Rh Ig can prevent temporary sensitization of the maternal immune system to Rh D antigens, thereby preventing Rh disease in current as well in subsequent pregnancies. In most countries, it forms part of modern routine antenatal care. With the widespread use of Rh immune globulin, Rh disease of the fetus and newborn has almost disappeared in the developed world. Risk of an Rh – mother being alloimmunized by an Rh + fetus can be reduced from approximately 16% to less than 0.1% by timely administration of Rh Ig in a correct dosage. When is Rh Ig administered? It is usually given at 28 weeks of gestation and again following delivery (as soon as possible; always within 72 hours) if the baby is Rh positive. Since the antibodies once formed in the mother’s body persist for life, therefore this medication is recommended in all the future pregnancies. It should also be given at times during pregnancy when it is anticipated that sensitization could occur such as during any medical or surgical intervention including termination of pregnancy, chorionic villus sampling, amniocentesis, following any abdominal trauma, etc. Indirect Coombs test (ICT) carried out on maternal blood during pregnancy is used to determine the presence of Rh antibodies in mother’s blood. To estimate the correct dosage of Rh Ig required to be administered to the pregnant woman, the maternal blood is screened for feto-maternal hemorrhage and presence of fetal cells. This is done using an acid elution method (Kleihauer-Betke test) or flow-cytometry. 125 IU of anti-D Ig is required to remove a bleed of 1.0 ml fetal cells. Depending upon the quantity of hemorrhage, preparations containing 250 IU, 500 IU, and 1500 IU can be given to the patient. It can be administered by either intramuscular (IM) or intravenous (IV) route. Care should be taken not to administer the IM-only prepration by IV route. Immune thrombocytopenia (ITP) is an acquired bleeding autoimmune disorder. It is characterized by a markedly decreased blood platelet count resulting in abnormal bleeding and bruising. In children, the disease usually has an acute onset of limited duration while in adults, it follows a chronic course. Anti-RhD immune globulin has a role in increasing the platelet counts in both children and adults suffering from acute or chronic immune thrombocytopenia. It is generally ineffective in patients who have failed splenectomy. Along with corticosteroids and intravenous immune globulin, Rh Ig is used as a first line therapy for ITP. It should always be administered via the intravenous route for treatment of ITP. Its exact mechanism of action is not known. It is hypothesized that Rh Ig forms complexes with RBCs which saturate Fcγ receptors sites present on macrophages. This results in the preferential destruction of RBCs while the antibody-coated platelets are spared. It is also thought to inhibit cytokine mediated phagocytosis of the platelets within the spleen. Platelet counts usually rise within 1 to 2 days of drug administration. Peak platelet counts are seen 7 to 14 days after initiation of therapy. The average duration of response is approximately 30 days. These are usually mild and not very significant. These include pain at the injection site, fever, malaise, headache, nausea, diarrhea, vomiting and stomach pain. Other side effects include allergic reactions and kidney diseases. In patients of ITP, significant intravascular hemolysis may occur and is a cause of concern. It is made from human blood plasma. Adequate steps are taken after collection of human blood and during manufacturing and processing to ensure that the product is free from bacteria and viruses.